TruSculpt 3D is an innovation RF (Radio Frequency) device that gives the skin deep heat. This causes fat cells to die, thus creating non-invasive fat reduction, body sculpting/contouring treatment. In the process, it can also temporally reduce the appearance of cellulite. It is designed to treat almost any area of the body including the abdomen, flanks, thighs, buttocks, arms and other stubborn regions where fat lingers. TruSculpt 3D is comfortable and requires no anesthetic. It is virtually pain free. Most patients describe the treatment as a hot stone massage and others report almost no sensation of heat at all. During a typical treatment, a small hand piece releases radiofrequency energy. This is placed over the targeted area and a small surrounding area. This energy cause fat cells to heat up and program them to liquefy and be removed through the lymphatic process after dying. The energy released from the heat of the TruSculpt 3D also causes skin contraction, for a slimming and smoothing effect on the skin. There is no downtime with this treatment, allowing you to return to your normal activity following treatment immediately. Patients will see significant improvement approximately 8 weeks following one TruSculpt 3D treatment and full results up to 3 months after. Additional sessions may be required to obtain desired results if more than usual results are expected. After a brief pre-treatment preparation, the TruSculpt 3D handpiece is applied to the skin. The handpiece will deliver a pulse of RF (Radio Frequency) energy that will last 15 minutes on each treatment area. The handpiece will then be moved to the next treatment area to which this process will be repeated until the entire treatment area has been covered. The TruSculpt 3D System is designed to provide an easy and relaxed procedure for non-invasive fat removal and body sculpting/contouring. The small issues that can arise include redness, sweating and mild tenderness in the treated areas. This may last up to a full day depending on your skin type. Bruising in the treatment area can occur but is rare. Usually, most of the side effects resolve in an hour. The most unique advantage of the TruSculpt 3D is that it is well documented to help tighten lax skin because of the radio frequency energy. RF has been used for many years as an energy source for tightening facial skin. Modifying how the energy is delivered by the TruSculpt 3D, lets the device reduce fat and tighten the skin simultaneously. 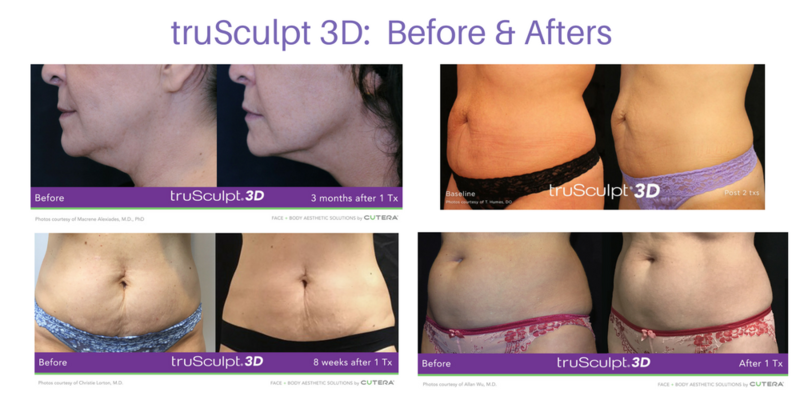 How does TruSculpt 3D Body Sculpting with Skin Tightening work? The device releases a radio frequency energy that delivers controlled, yet comfortable, doses of calming heat to the target zone, firming and smoothing problem areas over a 15-minute time frame. How long does a TruSculpt 3D non-invasive fat removal treatment take? Typically a treatment in one area takes 15 minutes and a lower abdomen and flanks takes 1 hour.